This great monument of red sandstone dominating a bend in the river Yamuna, 2km northwest of Taj Mahal was constructed by the Mughals during 1565-1571. It was Emperor Akbar who laid the foundation of this majestic citadel in 1565. 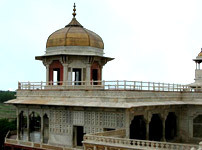 The fort was ready by 1571 period of Shahjahan, Akbar's grandson. The fort is crescent shaped, flattened on the east with a long, nearly straight wall facing the river. Fort's colossal double walls rise 69 ft in height and measure 2.5 km in circumference encircled by a moat and contain a maze of buildings which form a small city within a city. The fort contains splendid mosques and palaces in red sandstone and white marble built by two generations of creative builders during the time of Akbar and later Jehangir and Shahjahan. The wall has 2 gates, the Delhi Gate and the Amar Singh Gate. The original and grandest entrance was through the Delhi Gate, which leads to the inner portal called the Hathi Pol or Elephant Gate. But now the entrance to the fort is only through the Amar Singh Gate. Public access is limited to the southern part of the fort which includes nearly all the buildings of tourist interest. Jehangiri Mahal: This is the first notable building as one enters through the Amar Singh Gate and emerges out of the passage. Situated north of the gate at the end of a spacious lawn, the Jehangir's palace was built by Akbar as a residence for his son Jehangir. The largest private residence in the fort, it is a blend of Hindu and Central Asian architectural styles. The Mahal is reached through an impressive gateway and its inner courtyard consists of a two storey facade of beautiful halls, profuse carvings on stone, heavy brackets exquisitely carved with animal and floral motifs, piers and cross beams with remnants of the rich gilded decorations which once covered much of the structure. There is a verandah with slender pillars on the eastern front facing the river front. This is the most important building remaining from Akbars period as his successors demolished several of Akbar's red sand structures replacing them with marble one's. To the right of Jahangiri Mahal is a simple palace of Akbar's favourite queen Jodha Bai. Khas Mahal: Built entirely of marble by Shah Jahan in 1637, the Khas Mahal or the Private Palace demonstrates distinctive Islamic-Persian features. The enclosure has three pavilions overlooking the Yamuna, with a fountain opposite the central pavilion. The central pavilion an airy edifice, used by the emperor as a sleeping chamber has three arches on each side, five in front, and two turrets rising out of the roof. It overlooks the Angoori Bagh (grape garden). The Mahal is flanked by two golden (copper) pavilions, one with white marble and was supposedly decorated with gold leaf, while the other is made with red stone, which were meant for the prominent ladies of the harem. The Khaas Mahal provides the most successful example of painting on a white marble surface. On the three sides of the Grape garden are residential quarters of women. Musamman Burj: On the left of the Khas Mahal is the Musamman Burj, an octagonal tower with an open pavilion build by Shahjahan for his beloved wife Mumtaz Mahal. It is made of delicate marble lattices with ornamental niches for the ladies of the court to gaze out, unseen. The chamber with a marble dome on top, is surrounded by a verandah with a beautiful carved fountain in the center. The tower looks out over the River Yamuna and is traditionally considered to have one of the most poignant views of the Taj. This is where Shah Jahan spent his last few years as a captive of his son Aurangazeb and where he lay on his death bed, gazing at the Taj. Diwani-i-Khas: Diwan-I-Khas (hall of private audience) built by Shahjahan in 1636–37 was used to receive kings, dignitaries and ambassadors. It is a three sided pavilion with a terrace of fine proportions. Outside the structure is the marble throne terrace, where a pair of thrones were kept. The black throne belonged to Jehangir. Presently, entry is not allowed inside Diwan-i-Khas. Sheesh Mahal: Opposite to the Mussaman Burj and just below the Diwan-i-Khas hall, at the northeastern end of the Khas Mahal courtyard is the Sheesh Mahal or the Glass Palace. It is believed to have been the royal dressing room and its walls are inlaid with tiny mirrors, one of the best specimens of glass-mosaic decoration in India. The Sheesh Mahal is composed of two large halls of equal size, each measuring 11.15m x 6.40 m. Both are connected in the centre by a broad arched opening and on the sides by two narrow passages. Macchhi Bhawan: Opposite to the Diwan-i-Khas is the Macchhi Bhawan, a grand enclosure meant for harem functions. The emperor sat on the white marble platform of the Diwani-i-Khas facing this courtyard. It once contained pools and marble fountains which were carried off by Jat Raja Surajmal to his palace at Deeg. On another side stands a small mosque built for Shahjahan by his son Aurangzeb. Hammam-i-Shahi: To the right of Diwan-i-khas is the Hammam-i-Shahi or the Shah Burj. It is an airy apartment, attached to the residential quarters which was used as a summer retreat. Diwan-i-Am: The Hall of Public Audiences, made of red sandstone, was constructed by Shahjahan. It is here the emperor met officials and commoners and listened to the petitioners. The women of the palace could watch the court without being seen by others from the pavilion through jali (lattice) screens. The open sided, cusped arched hall (64x23m) built of plaster on red stone, is very impressive. The throne alcove of richly decorated white marble completed after 7 years work in 1634 was used to house the famous Peacock Throne, later shifted to Delhi by Aurangazeb and was finally carried away to Iran. The Nagina Masjid or the gem mosque is a private mosque raised by Shah Jahan with typical cusped arches for ladies of the court. There is Mina bazar for the royal ladies to buy things from the marble balcony beneath the Nagina Masjid. The Moti Masjid near the Nagina Masjid is a perfectly proportioned pearl mosque built in white marble. This grand mosque has three domes in white marble raising their heads over the red sandstone wall. Visit : 7- 6 PM.